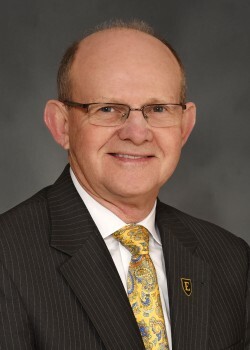 MILLIGAN COLLEGE, Tenn. (March 30, 2016) — Dr. Larry Calhoun, founding dean of the Bill Gatton College of Pharmacy at East Tennessee State University (ETSU), will join Milligan College in recognizing 10 local leaders who have demonstrated servant leadership in their careers and communities at the college’s annual Leaders in Christian Service program on Tuesday, April 5, at 11 a.m. in Milligan’s Mary B. Martin Auditorium located in Seeger Chapel. The service is free and open to the public. Calhoun, who received Milligan’s Leaders in Christian Service honor in 2013, will deliver the keynote address titled “The First Anniversary of the ‘Sparkle.’” Heritage, the college’s men and women’s a cappella ensemble, will lead the service. Having been at the helm of the Bill Gatton College of Pharmacy since it opened in 2005, Calhoun also has served in a variety of leadership positions within the healthcare and business industry. A Carter County native, he has served as president and chief executive officer of Wilson Pharmacy and Home Health in Johnson City; president and CEO of Unicoi County Memorial Hospital; vice president at Mountain States Health Alliance; as well as several positions with Johnson City Medical Center. Calhoun graduated from Hampton High School and completed pre-pharmacy studies at ETSU before attending the University of Tennessee College of Pharmacy in Memphis, where he was awarded a Bachelor of Science in pharmacy and Doctor of Pharmacy. Calhoun was recently honored with the 2016 American Pharmacists Association Academy of Student Pharmacists Outstanding Dean Award. After 10 years of leadership in the position, Calhoun recently announced he would be stepping down as dean of the Bill Gatton College of Pharmacy by the end of this academic year. Posted by Stephen Woodward on March 30, 2016.